We have selected the “best of the best”! Our own Todaro Bros. extra virgin olive oil; aged balsamic vinegar; 1/lb. 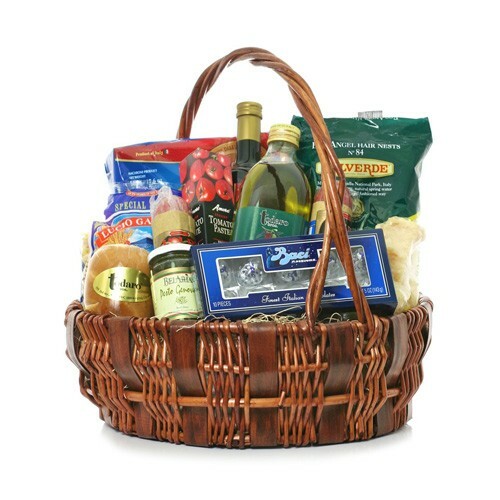 imported Parmigiano-Reggiano cheese; pesto alla Genovese; black olive paste; sun-dried tomatoes; stuffed olives; 1/lb. homemade smoked mozzarella; 4 different assorted pastas; salami; sopressata; almond biscotti; and Perugina ”Baci” chocolates. Occasionally substitutions of equal value must be made but the theme of the basket is always consistent.